The boundaries set out in the draft policy for the Shoreham Airport site were discussed by the planning inspector for the Adur local plan yesterday (February 2). An examination into the council’s local plan began on Tuesday at the Shoreham Centre and is expected to last for two weeks. The draft policy for the Shoreham Airport site allocates 15,000 square metres of employment generating floorspace including a mix of business, industry and storage use on the north-eastern side of the airport. The policy also supports training uses at the airport located at the southern point of the site. Planning inspector for the examination David Hogger asked whether the council would consider a plan showing a revised site boundary which extends southwards along the bank of the River Adur. James Appleton, head of strategic planning and economic development at Adur District Council, said the council would object to the proposed amendment relating to boundary changes as it was ‘not consistent’ with the council’s evidence base. Planning developers also discussed the need to retain views of the South Downs from the south side of the airport site. David Johnson from the Sussex branch of ‘Campaign to Protect Rural England’ said: “We are talking about reclaimed land on this site that has seen years and years of development. “We want to ensure that views from the southern end of the site, or from the Ropetackle, are not disturbed by large buildings at the airport. 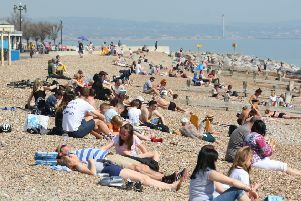 The council said it would work with Natural England, the Environment Agency and the Sussex Wildlife Trust to retain ecological value on site. For more information on the Adur local plan, please click here.